Very happy to be writing this post on a bank holiday, as it means that I'm not at work, and as much as I enjoy work I'm really not up to it today - over the past 3 days I've been up and down a hill (a relatively big one), burning myself because I didn't put sun cream on so that I don't dare move my neck in case it rubs against my clothes, been to A&E (not for myself and everyone is fine), lifted heavy things, and been to a tattoo studio. I'll come to some of the other stuff in future posts because it's probably too much to cover in a single one, but lets talk tattoos. I've always quite liked the idea of a tattoo but I've not really seen any that I would want to have on my body, and naturally with it being permanent I wanted to wait until I could find (or design) something that I really wanted. 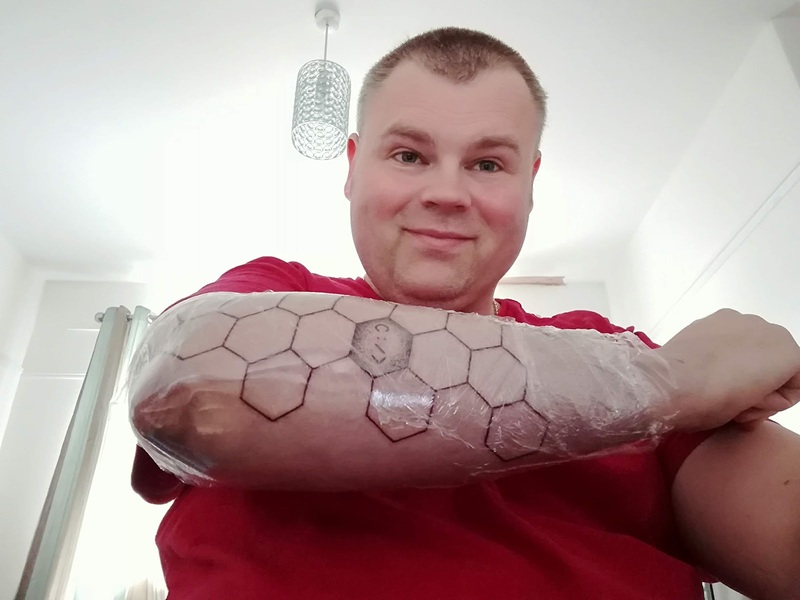 That was until I saw one on this page (third picture, not sure if I can share the image so doing this link) which I did really like, of an arm with hexagons down it. I think it's the geometric shape, the uniformity of the tattoo, that I like. 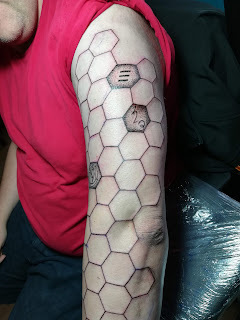 I then developed the tattoo with the idea that it'd be cool to put inside the hexagons symbols denoting things that I like or are important to me - one way of thinking of them is that it's a bit like game achievements? 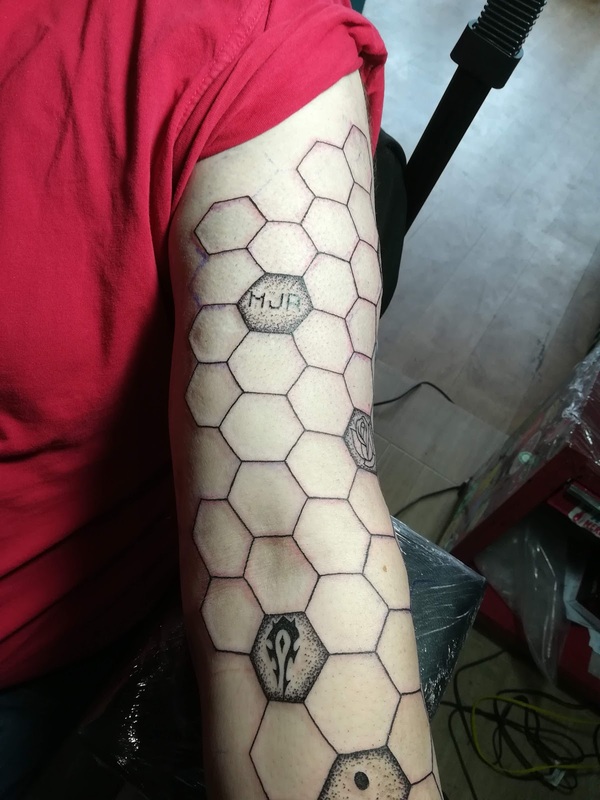 I've basically gamified my arm. Anyway, it means that in the future I can get more of the hexagons filled with other symbols. So, I went to Namaste Tattoo in Hull a few weeks ago, armed with sketches and images, to talk through what I wanted, and with their advice I altered some of the designs to make them black and to simplify some of them as originally some were really detailed and the risk is that over time the designs wouldn't look as good. Getting tattooed is a really interesting process, if you've never had it done. One thing I had in the back of my head was a question as to how they would manage to get the tattoo even doing it by hand. 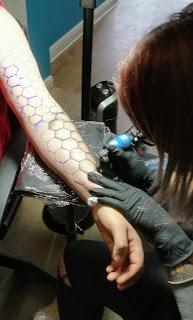 It turns out that what they do (or at least what my tattoo artist did) is they print out an ink template which is then applied to the skin, so that they have a template to tattoo on. 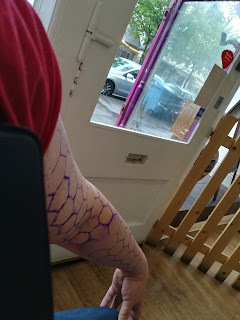 Once the ink template was dry it was time to begin the tattoo, and as I sat in my chair, arm resting on a little table adjacent positioned for Holly, the tattoo artist and owner of Namaste, to start, I did wonder at that point how much it was going to hurt. Well, it's not painless, but it's not bad, it is bit like having repeated pin pricks in short order. I think that I had maybe picked a good pattern in that it was lots of short bursts to do all of the lines of the hexagons so there was lots of little breaks in between as Holly repositioned herself, and when she was working on the inside of the arm that was certainly more sensitive, but it was alright. It's surprising how relatively quickly into the tattoo you find yourself playing on my phone with your free hand while your other arm is being impregnated with tattoo pigment inserted directly into the dermis. And I have to say, it was a fun day. 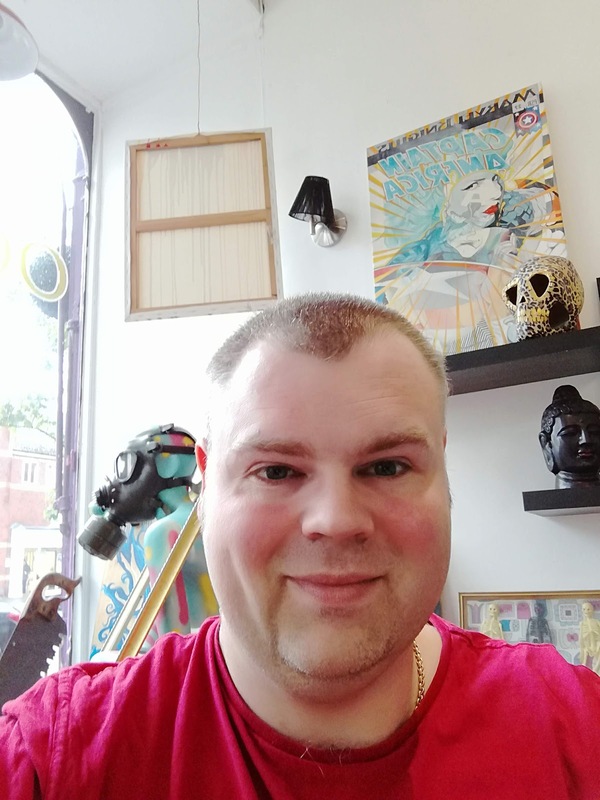 Holly and the other tattoo artists at Namaste are all really nice and friendly, and I had a great time the 6 or so hours I was there, it was just a really nice chilled day. I did wonder how much of the tattoo would get done on the day, in the end Holly got absolutely loads done which I'm over the moon with. I'm now in the aftercare phase, which means keeping my tattoo covered up away from the sun and making sure that it's well moisturised, and 2 days on I'm barely getting any pain from the tattoo, just the odd twinge or two in a couple of spots. I'm using antiseptic tea tree cream on it several times a day to moisturise and to make sure that it doesn't get infected. So in summary I'm really pleased with it and I'm certainly planning to return to get more of the hexagons filled in over time. I'd love to hear from you in the comments if you've got a tattoo or if you're thinking of getting one, and feel free to ask any questions! I don’t have any tattoos, but I would love to hear more about your hike. I’ve seen a mention or two on here but no real explanation. What gives, Mike?